John Houghton, fellow member of our Nottawasaga Model Railway NMR club and a regular attendee at weekly operating nights on my HO Utopia Northern layout kindly gave me two servo motors and two single Tam Valley Depot Singlet decoder boards to experiment with in May, 2013. He has upgraded to quad boards to control groups of 4 turnouts on his N-scale layout and the results of his installation are impressive. I had installed a few slow-action Tortoise servo switch machines on an earlier layout and wired a double crossover at the club with Tortoises, but I had no other experience with servo control. Slow action switch machines and manual controls are far gentler on handlaid Fast Track turnouts. A recurring problem I have had with some hand-made turnouts is the solder letting go at the printed circuit board tie at the points end. This can be annoying in the middle of an ops session. "Snap Action" twin coil machines can be a brute and are best used for commercial turnouts like Atlas or older Shinohara turnouts that have not been converted to DCC. I have plenty of twin coil machines from my many years in the hobby so I have left them installed wherever they happen to be. I decided to install the servo control on the first two turnouts in the yard throat into East Utopia. 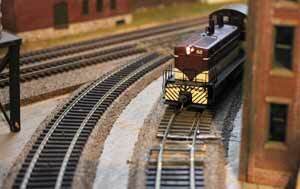 This is an 8-foot module with Code 83 hand-laid track and Fast Tracks turnouts. The module is sort of Free-mo style and it can be moved to access a storage room. I dislike crawling under benchwork at my age so I decided to install the servos topside next to the turnouts instead of using the under-benchwork linkages sold by Tam Valley Depot or my own adaptation. John designed his own with a metal "L" bracket. Retrofitting and drilling a hole up from underneath the benchwork now that all the turnouts are in place was not a job I wanted to tackle. Maybe I'll revisit this decision if all goes well with my topside trial. The benchwork is homasote on top of half-inch plywood so the first step was to cut a hole in which to mount the servo so that the servo control arm would just clear the top of the homasote. By trial and error I found that I could cut and dig out the homasote with a utility knife and an X-Acto knife. I kept checking the fit for the servo control motor to avoid making the hole too big. I then used a drill bit to cut through the plywood and finished the sides and ends of the hole with a jig saw and a rasp. I was careful to leave a small lip at both ends into which I could screw the end lips of the plastic servo motor shell. The servo shell has a lip with two small holes. I found I had to add a small piece of styrene under the ends of the servo shell to raise it to the correct height. I used Goo to hold the styrene in place and drilled pilot holes for the small screws that came with the servo motor. As you can see in the photo I bent a piece of piano wire into a "V" shape to connect the throwbar to the arm on the servo control motor. The neat thing about the Tam Valley Depot electronics is that the alignment is done electrically. As you can see in the top photo my Mickey Mouse setup used an old DC power pack set to 12 volts fixed, the Singlet dangling from its wires, and extension cables running under the benchwork to the plug for the servo control. Servos are used a lot for model airplanes, cars and boats. John had ordered his servos and cables in bulk from China to keep the cost down. As I only needed two cables I purchased a couple of 18" extensions at a hobby store that caters to all model hobbists. The cables cost me $4 each. Tam Valley Depot sells a Singlet Servo Decoder and a servo motor for $21.95 USD. Ordering servos and cables separately can bring down the cost if you are ordering in bulk. They also sell a DIY board with components should you prefer to populate the board yourself to save money. They also have a battery powered control board that will center the servo control arm during the installation. I can understand why this would be invaluable if you are installing more than a few servo control motors. The overall cost is similar to other methods like the Tortoise. I think it is more a matter of preference. Tortoise machines take up more space and can be a problem between decks or on a helix. I think the Tam Valley Depot method would fit more tighter installations but I must admit my experience is still limited. Here is my Singlet decoder hanging from its plug for setting up the LED colours. The Tam Valley Depot instruction sheet is straightforward and you only have to follow the sequence of holding and pushing two buttons to get the indications you want when the turnout is thrown. There are two methods for aligning the arm. First it is necessary to center the arm. This happens when the decoder is powered up. The arm on the servo motor is a press fit. It should start off aligned parallel to the turnout. The Singlet can adjust the endpoints of the arm's swing automatically. The point rails should be positioned in the middle of the approach track. The decoder has an alignment jumper plug that needs to be moved into the Align position. When powered up and after a brief delay the decoder will start the servo control arm moving until it finds a hard endpoint (stock rail), at which time it will do some fine tuning. When it is satisfied the LEDs will flash slowly indicating it is satisfied and then it will begin searching for the other stock rail. When it is finished aligning everything both LEDs flash to let you know it is done. Neat! Move the jumper into the Run position and try out the movement. 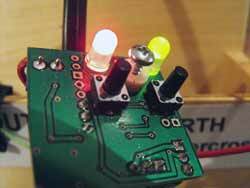 If all has worked properly you can move onto setting the colours of the bicolor LEDs for both positions. Then it's just a matter of going through a sequence to set up what colors you want (red/yellow/green or Off) for each LED and the speed of the arm action. I want the green to show for the mainline and red for the branch. The opposing LED should be off in each case. These colors are set manually. The entire procedure can be handled manually, including the speed at which the arm moves, by holding and pressing the two buttons as outlined in the instructions. The decoder for servo control can remember stationary decoder addresses. All functions can be programmed from the buttons or the stationary decoder commands can be entered from your system. Each system has a slightly different method for doing this. You need to check your system's manual for the correct method. A remote relay can be installed. Both SPST and DPDT relays are available from Tam Valley Depot. These could be used for powering the frog or for signalling. I had already installed micro switches to power the frogs so I left them in place on the other side of the turnouts. These are located beneath the benchwork using Eshleman linkages. On other turnouts I used Tam Valley frog juicers which are a wonderful invention and require only one wire to the frog. Lots of choices. I did the testing with 12 volts DC. It is also possible to pick up power from the DCC bus. I will do this for the final installation. Using the DCC bus allows your DCC system to use these as stationary decoders so you can throw the turnouts from your handhelds or computer.There's also a 5V logic signal input point on the board. For non-DCC control any power supply from 7-18V AC or DC is acceptable. I decided to make a small panel that I could attach to the fascia because I may decide to add more servo motors to other turnouts on the module. I cut a piece of leftover masonite hardboard the same depth of the fascia, mounted it on a frame of 1-inch pine, and painted it black. Tam Valley Depot supplies a template for locating the mounting holes. I used photocopies to locate where I wanted to mount the decoders on the panel. The correct drill bit sizes are in the instructions. The panel is now painted black with some leftover paint. After the paint dried I installed the boards. They are held in place with a screw in the middle from the front of the panel. The masonite was a little thicker than I would have liked. A metal or styrene panel would probably look better. I need to add some striping and labels. I left plenty of room for future additions. You can see in the photo how easy it is to plug in the extension cables from the servo motor. I connected 22-gauge power wires (from an old telephone cable) from the DCC bus to one board and stripped enough wire to reach the connections on the other board. I slipped some heat shrink tubing on the wire between the boards to avoid inadvertent shorts. If I add more servos I will put in a terminal strip to keep the power wires sorted. I also intend to disguise the servo control motors under a platform for the station siding that is behind the turnouts. The next step is to set up these stationary decoders from my Lenz system. Operators running trains between Utopia ands East Utopia can throw the mainline turnout from buttons at either location but have to physically pass through a swing gate and walk about 15 feet to reach the throat turnouts on the East Utopia module when following their trains. Being able to align these yard turnouts from Utopia using the Lenz handheld throttles would be a big improvement. The Tam Valley Depot instruction sheet said to hold down both buttons on the Singlet and the next command from the DCC system would be accepted as the programmed number. The instruction sheet refers to Digitrax and NCE but not to Lenz or other systems. For Lenz the command from the handheld throttle is F5 for accessory decoders. After pressing F5 while the two LEDs on the Singlet are flashing the number of the turnout can be entered. I entered 1 for the first and repeated it with 2 for the second. On Lenz (+) and (-) are used to throw the switch. Digitrax uses throw (t) and close (c) and NCE calls these N and R for normal and reverse. John helped me make some final alignment adjustments. The servo control motors don't have much torque so the points need to move smoothly. We slipped thin pieces of styrene under the wire between the motor and the throwbar so the motor wouldn't catch on the homasote. John also brought over his nifty Brothers label maker and whipped off some labels for the panel to help operators understand which way the three-way switch is thrown. We also added the Lenz command (F5) and the turnout number underneath the buttons. The only job left to do is to install repeater LEDs over in Utopia yard. I haven't decided how to do this. 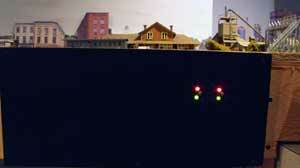 I could use dwarf signals at the East Utopia turnouts that can be seen from Utopia or put LEDs on the Utopia panel. I have the option of using the micro switches that are already installed to activate 24 volt relays instead of the frogs and use the relay contacts to power the frogs or install "frog juicers". 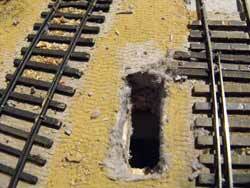 I've used both methods for previous installations on the layout. The alternative is to buy 5 volt relays from Tam Valley Depot and use the contacts available on the Singlets. These cannt accept the higher voltages. For now we'll concentrate on running the trains. It has been an interesting experiment. I'm glad John nudged me into setting up servo control! 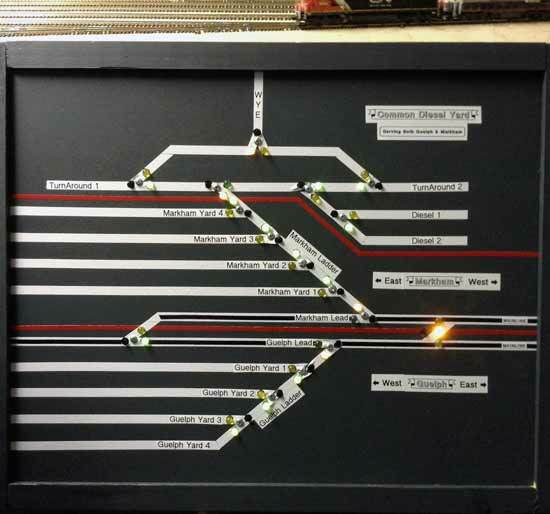 Here's a photo of John's main yard panel that shows how great it can look using Tam Valley's controls. He has individual controls on the fascia at each town with a captioned trackplan for all the sidings. It makes operations a breeze. His labelling is a lot neater than mine. This module is the only piece that survived the dismantling of the layout in 2015 in preparation for a move to a new home. It is now functioning on the new Utopia Northern under construction. Follow along as I build the new UNRR. 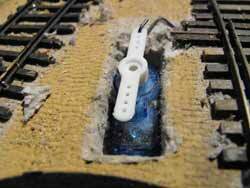 On my new UNRR layout I had an awkward location where I needed to install a servo on a turnout. It was going to be difficult to mount from underneath so I opted to install the servo beside the turnout. Friend Bill Payne worked out a simple method for modifying Tam Valley wooden servo brackets for top mounting. The original ones are designed for mounting servos under the sub roadbed. These pieces are cut from the original Tam Valley brackets. I glued them together with white glue. Bill added a strengthening gusset but I didn't bother. Here is how I mounted the servo beside the turnout using a length of wire to the throw bar. I put a piece of masonite under the bracket to raise it to compensate for the height of the cork under the track. I also used some double-sided carpet tape under the bracket to hold it in place temporarily while I adjusted the throw. When I was satisfied I drilled the holes for the screws in the base. Here you can see how I hid the servo inside a building. The servo is set back from the track so that engines and rolling stock will clear the building wall. I cut a notch in the wall so that the wire would have clearance. 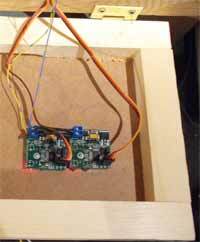 I drilled a hole in the plywood next to the servo so I could route the cable to the controller and panel. The throw was a little too long, even with the the jumper set for half-throw on the controller. I had used the second hole from the bottom on the plastic throw on the servo. To correct for the overthrow I unsoldered the throw bar on the turnout and respaced it. That's one of the advantages of making your own Fast Track turnouts. 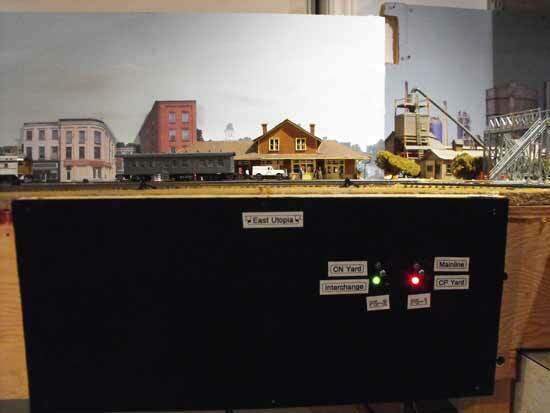 There are many other tips about building a model railroad throughout my website and I am chronicling the construction of the new Utopia Northern. Go from "servo-control" to DCC overview. Go from "servo-control" to other examples of hiding top-mounted switch machines. Go from "servo-control" to Track overview. Go from "servo-control" to DCC turnout wiring. 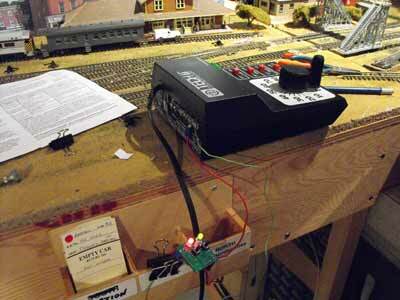 Go from "servo-control" to model railroad wiring. Return from "servo-control" to my Home Page.